The Communion Veil: Infinity Over Infinity - or Why Jesus has to be God. Infinity Over Infinity - or Why Jesus has to be God. So let's go back to the Father's memory. The Father's memory is infinite, which means He will remember all things for all time. (He is actually not bound by time, but that is another blog post) So think about that, what you do in the flesh God will remember for all time. Every thought, word, or deed is remembered perfectly by God. Your unforgiven sins are remembered by God forever, and as such unforgiven sins will face another aspect of God, His justice. The justice of God is perfect and also infinite. If something is perfect, then it is implemented with perfection, and carried out to it's perfect end. There is no skirting the justice of God. At the judgment, there shall be no excuse for your sin, for if it is unforgiven and if God's justice is perfect, then you MUST face the consequences of your sin at the judgement. 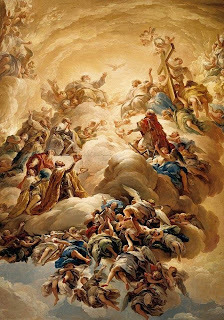 God, although loving you and not wishing your banishment to Hell or suffering in Purgatory, because of His nature of being perfectly just, He will carry out that perfect justice. He can be nothing less. Can the perfect justice of God turn a blind eye to an offense? No. We will pay every farthing for our sins, either in purgatory or for all time in hell. But wait, we have the Blood of Jesus, right? Yes, but that was 2000 years ago, how does an event 2000 years ago apply to the sins of those today? There is only one answer, the Cross of Christ is a oblation by an infinite God which can reach through all time. God is infinite, He took flesh in the second person of the Holy Trinity, Jesus. Jesus, true God and true Man. The Infinite God, who came to earth and gave the perfect oblation for all time. For if God remembers forever and our sin has an infinite consequence, then what can cover a judgement that will be on us for all time? What can cover infinity? Only infinity. The number 2 cannot cover infinity, nor can the largest known useful number in the universe (Grahams Number) encompass that which is forever and ever. 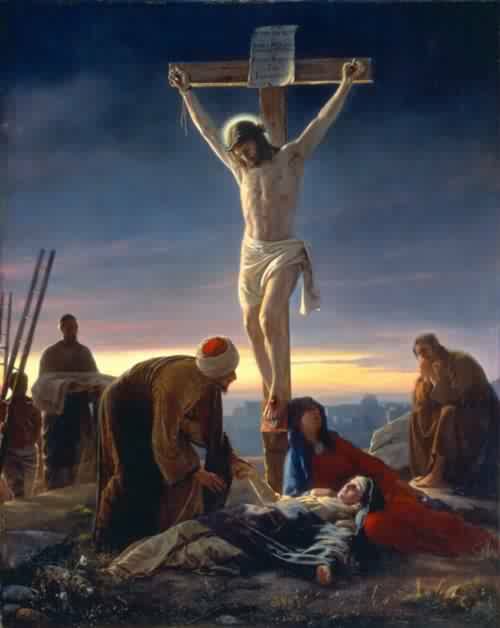 The infinite oblation of the blood of our Lord Jesus Christ, true God and true Man is the only thing that can cover a sin that has an infinite consequence in eternity. Infinity over Infinity, the only way to open Heaven so that God can give us His greatest gift...Himself. For their is nothing else worth trying to attain in this eternity that we face than to see our God in the face. For those that say that Jesus was not God, they are either mislead or liars. If Jesus is not God then the sacrifice He offered was finite and not infinite and only covered the sins of those that were present at the Crucifixion, and not for us. (As humans, we can offer penance and sacrifice to God for the salvation of souls, but only while we are in the flesh, when we are in eternity and have no flesh we can no longer offer sacrifice, so if Jesus was not God, His sacrifice was only while He was on the Earth, and no farther.) And if this is so then we are still in our sins and facing an eternity without God. So, Jesus was God, His sacrifice was a perpetual sacrifice for all humanity from the time of the Crucifixion until the end of time. We can alleviate the eternal punishment (judgement) for our sins by the Confessional and Penance. (Confession sounds pretty good right now, doesn't it?) Go to confession, go frequently, and do MUCH penance for your sins and the sins of those you love. Time is shorter than you know. Here is a very good video about Grahams Number: Click Here!